Planning your next summer visit has never been easier! We've got the fun and sun, and now we need you! Choose from available dates to plan the perfect summer getaway! Interested in coming during one of our events? Visit our events page for information on upcoming fun at the park! We look forward to seeing you soon! Join us for Premium Passholder Appreciation Week! This week is devoted to our Premium Passholders! Enjoy discounts at food and beverage locations and Premium Season Passholder's Bring-A-Friend FREE daily! Join us this Labor Day weekend for some fun and sun! Purchase admission for as low as $21.99 per person! Watch as rubber ducks race down the lazy river presented by Quick Quack Car Wash! This event benefits the Child Life Programs at Sutter Children's Center and UC Davis Children's Hospital. Purchase racing ducks at theduckdash.com starting in July! Join us for Opening Day and help us kick off summer fun! Guests will receive special discounts at food and beverage locations as well as special promotions that will be happening through out the day! Join us this Memorial Day weekend for some fun and sun! Purchase admission for as low as $21.99 per person! Celebrate with fun and sun this Fourth of July Weekend! Admission as low as $24.99 when you buy 4 or more! For more information and to sign up visit rwsac.com/swimminglesson! Raging Waters Sacramento will be open from 11:30 am - 6 pm. Park hours and attraction availability are subject to change without notice. Raging Waters Sacramento will be open from 10am - 4pm. Park hours and attraction availability are subject to change without notice. Raging Waters Sacramento will be open from 11am - 6pm. Park hours and attraction availability are subject to change without notice. Raging Waters Sacramento will be open from 11am to 7pm. Park hours and attraction availability are subject to change without notice. Raging Waters Sacramento will be open from 11am - 6 pm. Park hours and attraction availability are subject to change without notice. Raging Waters Sacramento will be open from 11:30am - 6 pm. Park hours and attraction availability are subject to change without notice. Raging Waters will be open from 11am - 5pm. Park hours and attraction availability are subject to change without notice. Raging Waters Sacramento opens at 11:00 a.m. unless otherwise noted. Slides, attractions and refreshment stands begin to open progressively starting at 11:00 a.m.. Raging Waters Sacramento usually closes at 5:00 p.m. unless otherwise noted, but may close earlier or later based on factors including weather conditions. Save when you buy online! Your full priced general admission ticket is actually a Sacramento Season Pass! Visit all summer long, plus get unlimited admission to the Ca State Fair! The perfect summer destination! 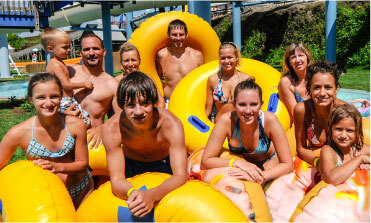 Save on admission for groups of 10+ and enjoy fun and sun for the entire day! Enjoy one meal, each visit, all summer when you purchase the All Season Dining Pass!